Out of stock. Join the waitlist to be emailed when this product becomes available. This is a pre-order item! It will ship out on or before the street date of Savagery. 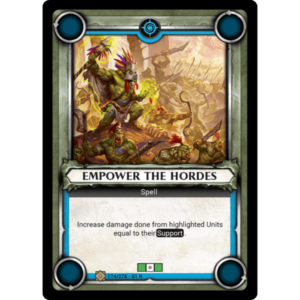 Wanting to play Warhammer Champions but turned off by the randomness and uncertainty of booster packs? This is the set for you! A Champions Saga Set includes the following from the Savagery set of Warhammer Champions. *In Savagery, there are 7 art variations of the Festering Nurglings card. A Saga Set will include three random copies of the card, which may or may not be different variations. 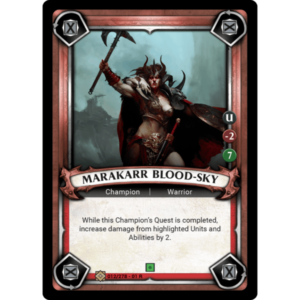 Buying a Champions Saga Set means that you will have a full playset – every card, every faction – of the Savagery set of Warhammer Champions as soon as it hits shelves. This Saga Set ships by the street date of Savagery, so your cards will arrive instantly! We started creating Saga Sets for Star Wars: Destiny in 2016, and have consistently heard from players who find them invaluable for keeping up up with the game. Given this feedback, we decided to offer them for Warhammer Champions! There are few things as disappointing as buying a mountain of booster packs and not getting the cards you want. 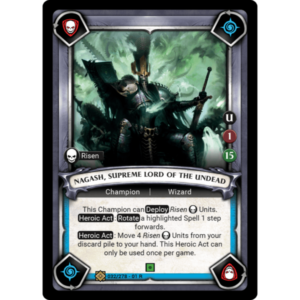 Our Warhammer Champions Saga Sets take the random “chase” out of the game and allow you to dive right into the action with the Champions, Blessings, and Units you want to play! No frustration. No disappointment. No incomplete decks. You only need one Saga Set to get everything you need for Warhammer Champions, guaranteed! Skip the frustration and wasted time, and get the entire third set of Warhammer Champions with a single purchase. Having spent a significant amount of money buying booster box after booster box for several cycles of Star Wars Destiny, I can understand the challenges that collectible card games present. This is especially true for those who like to have a complete set of cards for each cycle. Unfortunately, this method of buying booster boxes also meant I had a large number of duplicates for cards that have no real value in the secondary market. Because of my terrific experience with Team Covenant’s Destiny Saga Sets and their other products so far (their tokens are fantastic! ), I have chosen to pre-order the reprint of the first cycle of Warhammer Champions: Age of Sigmar. This will allow me to have all the cards for each faction within the cycle. Take it from an extremely satisfied customer that has purchased a lot of items from this company, Team Covenant is doing expandable games the right way and we are the beneficiaries of their passion for what they do!